In his closing address to the Annual Meeting, President Hammond started by acknowledging the importance of ETFO’s on-site child care program for delegates’ children. He called it one of the most important Annual Meeting decisions made over the last few years. In summarizing the important decisions made during the week, he highlighted the historic step of expanding the number of Executive positions for members from designated groups and the decision to campaign on the government establishing an external education funding formula review. Hammond spoke to the important contribution social justice speaker Nahanni Fontaine made to our understanding of issues related to murdered and missing Indigenous women and girls, which underlines educators’ role in moving forward with reconciliation. He also thanked Canadian Teachers’ Federation president Mark Ramsankar for reminding us about our connections with educators across the country and the threat of privatization. 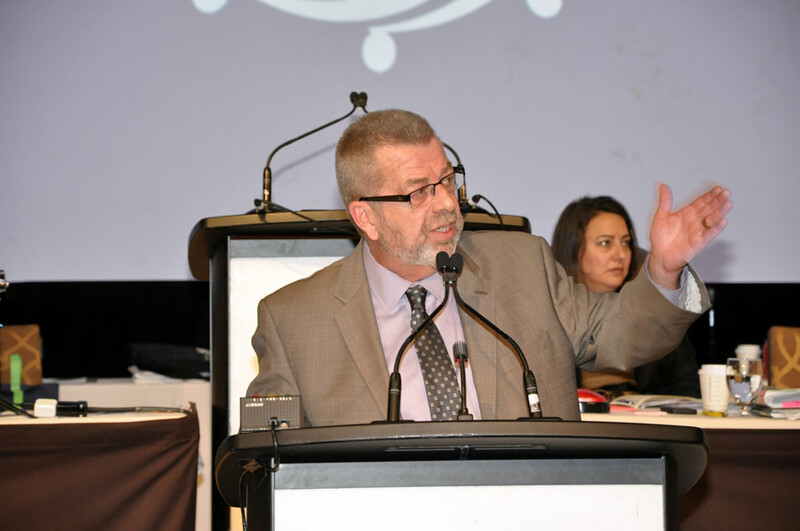 He pointed to Ontario Teachers’ Federation president Mike Fould’s review of the Ontario Teachers’ Pension Plan and thanked him for his acknowledgement of ETFO’s campaign to address the incidence of school violence. Hammond committed to ensuring ETFO would continue to make school violence a Federation priority in the upcoming year. Hammond stated that, as we anticipate the upcoming provincial election, ETFO faces a critical period for mobilizing and engaging members to ensure the Federation has an impact on the election outcome and moving ETFO’s Building Better Schools plan forward. In his concluding remarks, he acknowledged the importance of so many members putting themselves forward during the Executive elections and thanked members of the Steering Committee for their contribution to the election process. Hammond concluded by thanking the outgoing Executive members for their service to the Federation and welcoming the 2017-18 Executive to the stage. Yes. ETFO has a number of Eastern Ontario locals who sent delegations to Annual Meeting to represent their local members.